NEW YORK (Nov. 10, 2017)  A fantastic lineup of marching bands will entertain viewers with a wide variety of music during the 91st Annual Macy's Thanksgiving Day Parade. 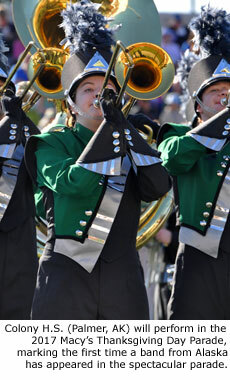 The parade will feature more than 2,500 band members performing in high school, university, military and all-star marching bands. The groups will perform for more than 3.5 million spectators and 50 million television viewers nationwide during the 2017 spectacle which steps off at 9:00 AM on Thursday, November 23. For the first time, a band from Alaska will perform in the Thanksgiving spectacle. The Colony High School Marching Band from Palmer, Alaska, is the state's only active marching band and will be making its first trip to the Macy's Parade. For all of the invited marching bands, their Macy's Thanksgiving Day Parade journey began more than 18 months ago, when Macy's officials extended invitations to participate in the 2017 parade. Selection into the Macy's Parade was based on submitted videos of past performances, awards, national recognition, letters of recommendation and each band's unique personality to captivate an audience. Since their selection, the marching bands have been busy perfecting their skills and raising funds for their trip to New York City. 34th Street Performance: "Ain't Nothing Wrong With That"
34th Street Performance: "Ode to Joy"
34th Street Performance: "Holiday Celebration"
34th Street Performance: "We Gather Together"
34th Street Performance: "Stand By Me"
34th Street Performance: "25 or 6 to 4"
34th Street Performance: "It's the Most Wonderful Time of the Year"
34th Street Performance: "Pride in the Past, Promise in the Future"
34th Street Performance: "My Favorite Things"
34th Street Performance: "Air Force Song"
34th Street Performance: "Enterprising Young Men"
34th Street Performance: "This is a Great Country"
34th Street Performance: "Gimme Some Lovin'"
34th Street Performance: "Shake Your Body"
34th Street Performance: "House of Make Believe"
See more information on Marching.com about the Macy's Thanksgiving Day Parade.